HUGE 2019 – Time for Change! Sorry folks but there won’t be a Haworth Ukulele Group Extravaganza this year. We’ve outgrown both the venue and the format so we’re thinking again. 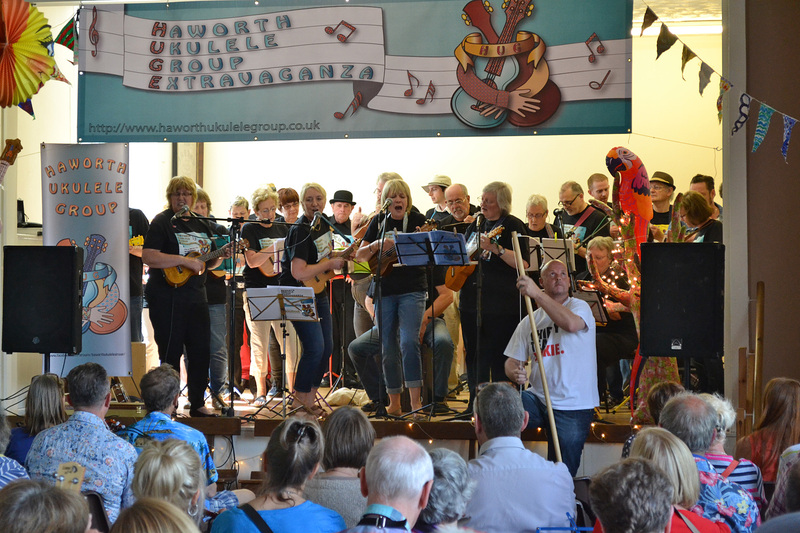 Our Haworth Ukulele Group Extravaganzas have been phenomenally successful over the last 6 years. So successful in fact that we’ve now outgrown both the venue and the format and it’s hard to know how we’d top the amazing experience that was the Pirate HUGE! This has made us think afresh and look for different ways to have fun playing ukulele with all our fab ukulele friends from around the area. Watch this space for future HUGE (but not HUGE as we’ve known it) events. HUG would like to thank everyone who has supported our HUGE events in the past and helped us to raise thousands of pounds for local charities. We aim to have just as much fun but in a different way and we hope you’ll be part of it. £1200 raised at HUGE 2018!! HUGE thanks to everyone who came along for your fun, your music and your generosity. We’ll be donating the money, which was raised at HUGE and by HUG in recent months, to our local Sue Ryder Manorlands Hospice. Thank you!! HUGE 2018 is on Saturday 16th June at the Old School Room, Church Street, Haworth. Doors open 11.00 a.m. See our programme for details. Entry fee £6.50 (free to under 14s when accompanied by a paying adult). The entry fee includes a songbook for all paying attendees. Extra songbooks, plus HUGE badges and stickers will be available to buy. In the evening the very talented Chris McShane is playing a concert for us at Cobbles and Clay Cafe from 7.30 p.m. Tickets for the Chris McShane concert are £7.50 so you can have a whole day and evening of music and ukulele fun for just £14.00!!! On Sunday 17th June (weather permitting) there will be a HUGE SUSSies event in the garden at The Old Hall, Haworth 1.00 – 3.00 p.m. Bring HUGE 2018 songbooks and SUSSies songbooks if you have them. HUGE is a charity event and our chosen charity this year is Sue Ryder Manorlands Hospice. This year the theme is pirates so get ready to swash those buckles and shiver some timbers. Pirate fancy dress is encouraged. 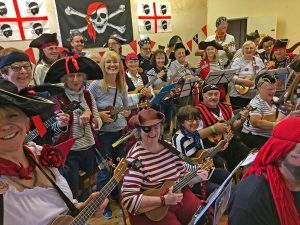 HUGE 2018 will be the usual mix of ukulele mayhem and fun with a charity raffle, lucky dip bottle stall and Treasure Hunt game with some excellent prizes including ukuleles and rum! So bring your doubloons and pieces of eight! FLASH MOB!! Saturday 12.00 top of Haworth Main Street. Refreshments (HUGE ALE, hot and cold drinks/crisps/biscuits) will be available to buy at the Old School Room during the afternoon at very reasonable prices. We are licensed so we’ll be serving alcoholic drinks including HUGE Ale provided by Wishbone Brewery in Keighley. PLEASE NOTE: only alcohol bought at the event may be consumed on the premises. There are lots of cafes, take away sandwich places, pubs and restaurants in Haworth and all within a short walk of the School Rooms. Sunday Sussies at HUGE! There will be a Sunday session in the pub garden at The Old Hall, Haworth on Sunday 17th June between 1.00 and 3.00 p.m. (weather premitting). Please bring your HUGE 2018 songbook and your Sussies songbook if you have one. 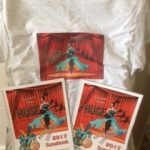 Sussies songbooks are available to download at https://www.facebook.com/groups/sussiesjam/files/ but we’re sure you’ll be able to share. HUGE aims to be a family friendly event based on the principles of equality, inclusion and fairness. We hope all participants will respect that and avoid use of any language or behaviour that may cause offence to others. We all just want to have fun and raise funds for a good cause. To give you an idea of what it’s all about here’s our 2017 Flash Mob. A HUGE thank you to everyone who came to HUGE 2017 – you were brilliant. We raised a fabulous £1300 to share between our two charities – Sue Ryder Manorlands Hospice and BAMHAG (Bradford and Airedale Mental Health Advocacy Group. Thanks to everyone who helped with planning and over the weekend – you are the best! It’s great to catch up with ukulele friends and make new ones! Thanks again.See you at HUGE 2018! List of jobs needing to be done is here – please email haworthukulelegroup@gmail.com if you can help. HUGE Songs from the Musicals!! 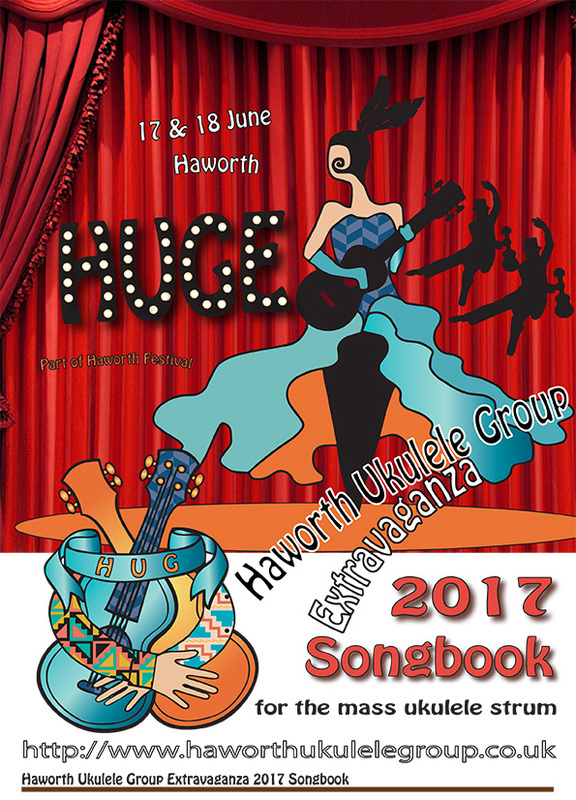 Haworth Ukulele Group Extravaganza 2017 is nearly here! This is our fifth HUGE and if you want to know what it’s all about please read on and scroll down to see videos and photos from previous years. The main thing you need to know is that it’s great fun and our mission is to provide as many opportunities for playing ukulele as possible. Performances, plenty of mass uke strumming, tombola and raffle, HUGE Ale, evening entertainment, steam trains and all in the unique setting of Haworth Old School Rooms and the surrounding area. Our theme for 2017 is ‘Songs From the Musicals!’ As always there’ll be plenty of opportunities for strumming during the afternoon as we work our way through the new songbook. We are making a change this year and we won’t be running formal workshops. Instead, on Saturday 17th (from 11.30 a.m. – 12.45) there’ll be a jam session in the historic Black Bull pub where Branwell Bronte had his own chair. Beginners Welcome! Although we are not running a formal workshop for beginners if you want to get started playing ukulele just bring your uke (or borrow one from us) and there’ll be plenty of help around to get you strumming. You can get our Beginner’s Pack from the merchandise stall. 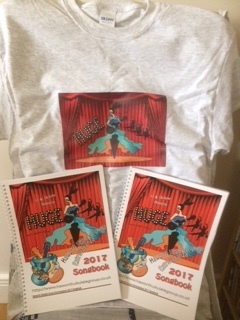 Songbooks are £6 and t-shirts £10 – both are available at HUGE 2017! You can download a programme and information here. From 1.00 p.m. on Saturday 17th June we’ll be inviting uke groups to play on the stage at the Old School Rooms, Haworth. Every group has been asked to include a song or two from a musical in their set – we’re looking forward to hearing what everyone has chosen. 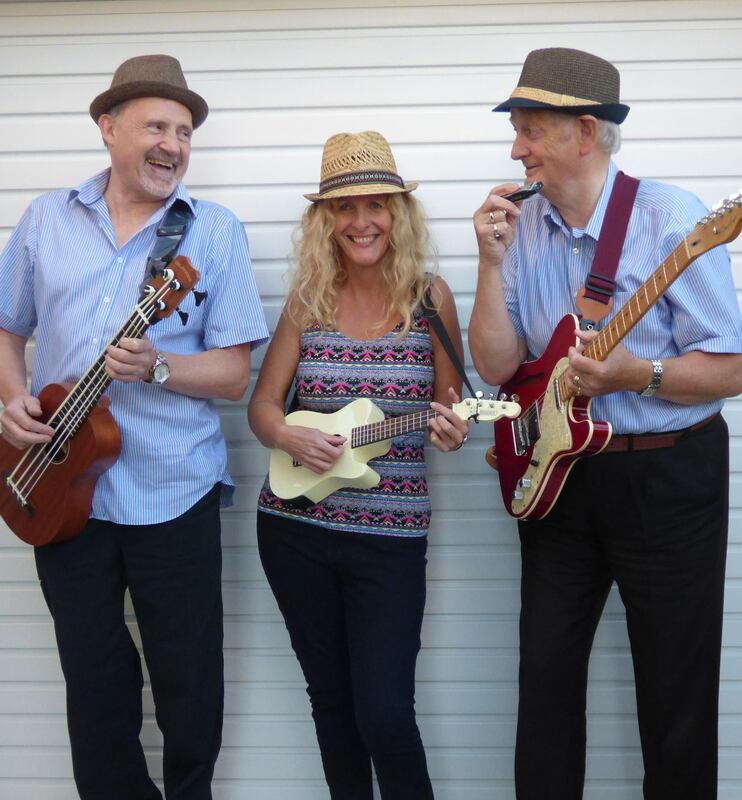 On Saturday evening the fabulous No Fluke will be playing at Cobbles and Clay Cafe from 7.30 p. m. Tickets £5.00. No Fluke played a fantastic set at our Swinging Sixties party at HUGE 2016 and we’re really looking forward to seeing them back again. As well as entertaining us with their own set of songs No Fluke will be playing some songs from the HUGE 2017 songbook so we can all join in. Bring your uke! Cobbles and Clay is a licensed cafe selling a range of wines and bottled beers as well as soft drinks, teas and coffee. Toot, Toot! 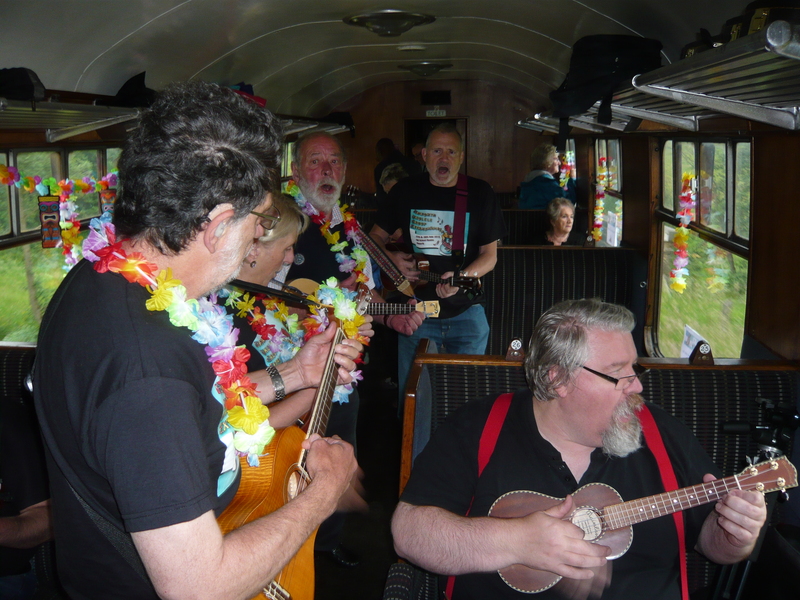 Fifth year running for the original Ukulele Steam Train Special. All aboard and bring your HUGE 2017 songbooks. Join us in our private carriage on the 11.51 from Haworth for a round trip on the KWVR arriving back at Haworth at approximately 13.20. Tickets must be bought before boarding the train so please allow plenty of time. If the weather is kind there will be an informal jam session after the train in the pub garden. The adult fare is £9.20 each. Don’t forget to pick up your voucher at HUGE and get this reduced rate fare for the HUGE 2017 Steam Train Special. We cover all our own costs for this event so we ask for a small entrance fee of £6.00 for the afternoon event and this includes a 2017 HUGE Songbook. It’s a bargain!! The total cost if you go to all the events over the weekend is £20.20 – a bargain for a weekend of ukulele fun!! Refreshments – tea/coffee, soft drinks, wine and HUGE Ale (from Wishbone Brewery)** will be available at very reasonable prices. Snacks such as crisps will be available to buy but we don’t sell sandwiches or hot food. The Old School Rooms, Church Lane, Haworth BD22 8DR http://www.hawortholdschoolroom.org.uk/ Our main venue for Saturday. It’s a lovely old building with plenty of Bronte related history. 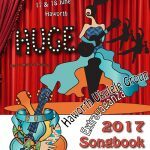 HUGE 2017 is part of Hawfest Extra. Haworth Festival is a community music and arts festival organised by volunteers and outside of the main festival week in July supports additional community events. Well done HUGE 2016 ! We’re delighted that HUGE 2016 raised just over £600 (including gift aid) to share between our chosen charities: Bradford Metropolitan Foodbank and Manorlands Hospice at Oxenhope. If you want to find out more about what these two brilliant organisations do – please take a look at their websites. HUGE thanks to everyone who contributed to the event by sharing their time, their joy, and their creative spirit. Here’s to next time! It’s HUGE and it’s in Haworth! 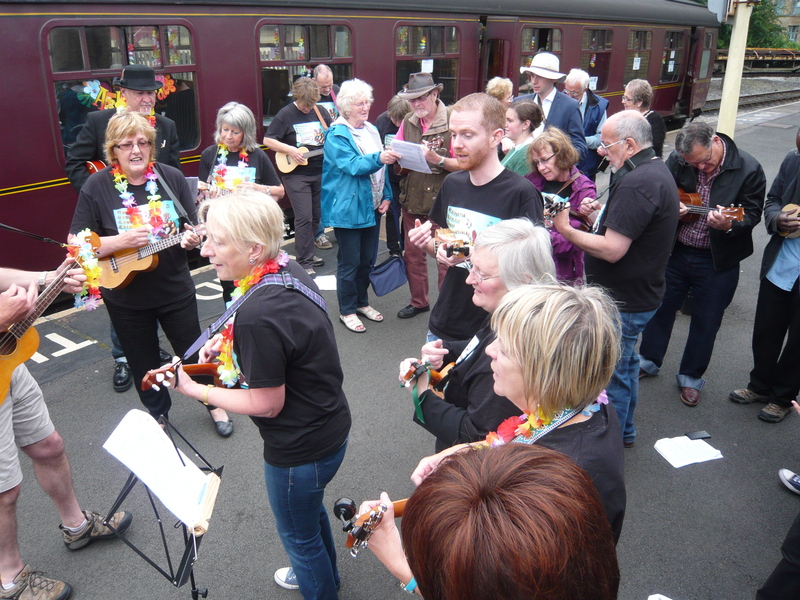 The 4th Haworth Ukulele Group Extravaganza – or HUGE 2016 is at the Old School Rooms, Haworth on Saturday 25th June and on the morning of Sunday 26th June we’ll be on the KWVR for the ukulele steam train special. It will be Sixties weekend in Haworth so get dressed up and get ready to Twist and Shout. 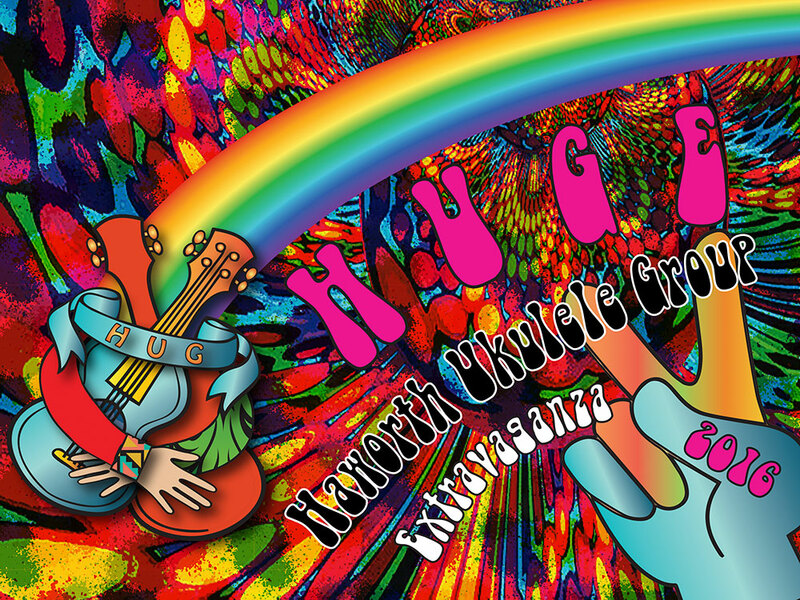 HUGE is a community uke festival organised by Haworth Ukulele Group (HUG). 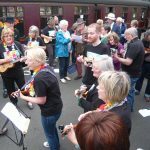 Our emphasis is on playing ukulele, sharing songs and having fun with other ukulele players from beginners to experienced from far and wide. 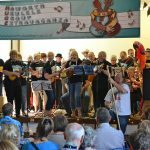 A large part of the festival is the opportunity for community ukulele groups to perform on stage with a full PA and an appreciative audience. Each year it gets better and better! In between we all join in playing songs from the HUGE 2016 songbook so you can be playing uke every 20 minutes if you want! HUGE Ale (Wishbone Brewery Bandit Bitter), wine and soft drinks are available in the School Rooms. We don’t do food but there are plenty of cafes and shops nearby. There is plenty for uke players and non-uke playing friends to do in Haworth, the home the Brontes, and there’ll plenty of 60s style entertainment and events that weekend. 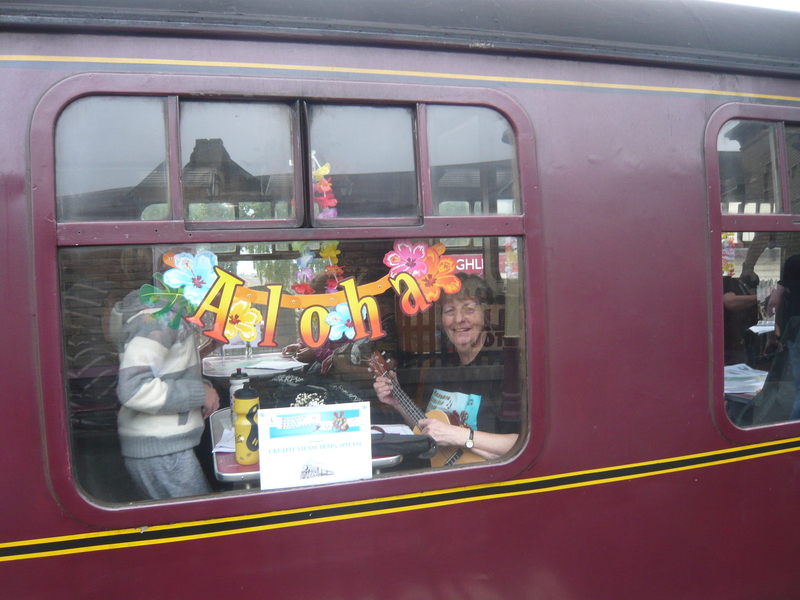 Workshops, uke groups, Saturday night 60’s party, ukulele steam train special – it’s all here! 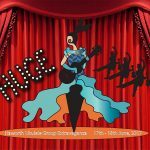 HUGE has an emphasis on participation with workshops and slots for community uke groups like ours to play on stage during the Saturday afternoon. There are also plenty of opportunities to play uke – you can be playing every 20 minutes if you want! This year there are Beginners and Strumming techniques workshops at the Old School Rooms plus a new session led by uke blues man Keef Jackman at the Black Bull pub. If you want to learn to play but haven’t got a uke yet we will have some available to borrow for the workshop. HUGE is non-profit making and aims to raise funds for local charities so this year we’re asking everyone to make a contribution of £5. 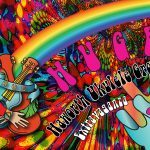 We hope you’ll agree that HUGE is a huge bargain at only £5 for which you get a free 86 page songbook, an afternoon of entertainment and ukulele strumming with lots of other lovely uke people, and a 60’s fab and groovy party in the evening with live music and your chance to play and sing along. The main venue is the Old School Room at Church Street, Haworth, Keighley BD22 8DR. It is near the Parsonage and is a lovely old building where Charlotte Bronte taught. There is a car park nearby. We recommend that you use the Council controlled car parking near the Parsonage just off West Lane. HUGE 2016 T shirts will be available to buy. On Saturday 25th June at 7.30 – 10.30 p.m. there’ll be an informal 60’s party for HUGE participants. The evening will feature live music from Keef Jackman, No Fluke and Reuben and Ruth. Plus there’ll be lots of strumming groovy 60s sounds and dancing the night away to your fave discs. Get your hippy gear on and come along – fancy dress is of course optional but encouraged! 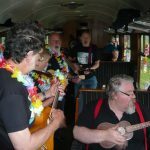 On Sunday morning 26th June, for the 4th year running, we’ll be on the Keighley and Worth Valley Railway Ukulele Steam Train Special on the 11.06 from Haworth Station for a round trip of the line via Keighley and Oxenhope. The trip takes about 90 minutes on the line that’s famous for the Railway Children and we get off the train and play on the platform at Keighley and Oxenhope. 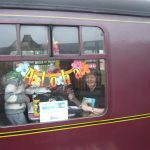 Thank You – HUGE thanks to all our volunteers who give their time energy and creativity and to our supporters for raffle prizes and help.